Welcome to my (Malcolm Schonfield’s) home page on SL. I am a British player living in France. My French rating is 1 kyu FFG ( page on the ffg site). Top FFG ranking ever reached: 2 dan. I used to play on KGS with the account: “malcolm” which is around 1 or 2D. 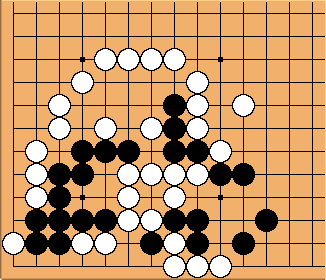 However since 2014 I mainly play turn-based Go and t-Go on littleGolem (littlegolem is the only place I know where you can play t-Go). 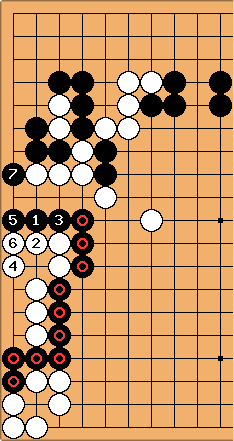 I learnt Go in 1994 and have been a fan since then! 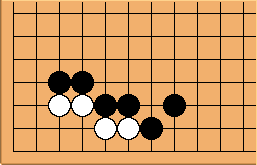 Since 2014, I’ve been blogging occasionally about Go, partly in English and partly in French. 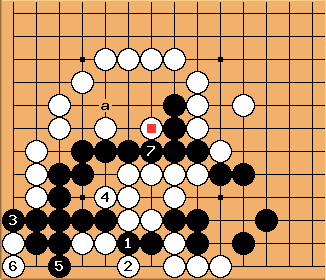 The blog has some commented teaching games at beginner level, and a few posts that may be interesting to more advanced players. 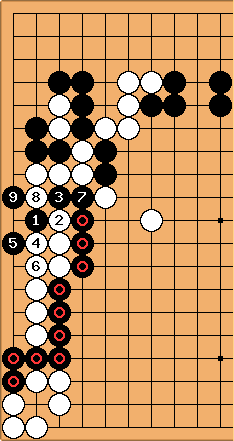 As of 2017 I have also started blogging about toroidal Go. The following sections are all a bit old. I was stuck for a long time on finding the correct answer to . unkx80: I think Black should play and . 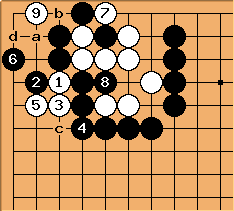 See joseki-related life-and-death example 9. Malcolm: Thanks, the same day you gave me the solution I ended up using Thomas Wolff’s GoTools tsumego program to get the answer. I had a blind spot, overlooking the double atari at 'b'. 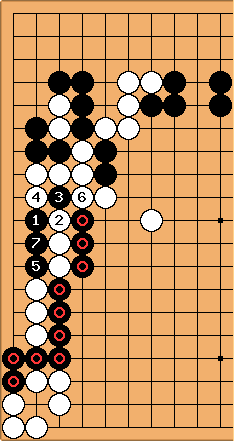 White can’t connect with 6 because Black can make a double snap-back (see next diagram). So Black puts 4 stones in atari in sente. It took me ages to find this solution. 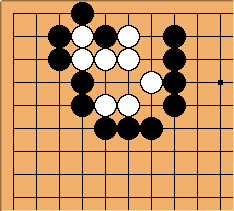 I think I had a blind spot due to the following erroneous reasoning: "after 6 white has two eyes and is therefore alive. There is no need to look any further". Lesson to be learned: two eyes are sometimes not enough! Or: beware of damezumari! An alternative. Black 7 at 5, White 8 at 3. After 9 a and b are miai. This problem is old: it figures in Xuanxuan Qijing where in the version I have it’s problem number 4 (of 347 problems...). 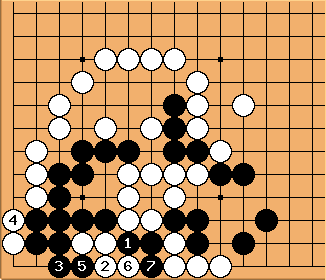 Here’s a nice tsumego I found in an old volume of the french Go magazine RFG (nÂ° 89, 2000), in an article by Pierre Audouard. It took me about 15 minutes this morning to solve! Here’s an under-the stones tsumego from TrainLikeAPro volume 2. It took me days to realise why "a" is wrong - another damezumari I missed. at . Result is a direct ko with the first threat to be found by the defender. 31-1-07 : I’m completely stumped by the following problem from TrainLikeAPro, vol. 1, day 2. I do not know how black deals with . Looks to me like white lives. so, what am I missing? unkx80: The first answer that comes to my mind is . No, this is not a typo. I did consider . But if in this diagram, what else is there but ? Then, white lives with . unkx80: This means that I made a reading typo when suggesting in the previous diagram. Right now I see no solution to your . Malcolm: OK. I’ve updated TrainLikeAPro with this analysis. It does seem like an error in the book. Hope you don’t mind me using your name. Thanks for the help. 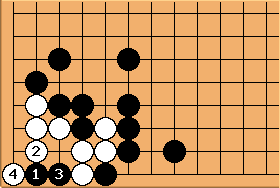 If White plays 4, he lets Black live and loses points on the side: very bad. unkx80: I thought, there might be multiple solutions to this problem. If at , then and , which reverts to one of your earlier diagrams. Malcolm: Yes, you’re right. Thanks for the comment. The following classical problem is in the Xuanxuan Qijing collection. 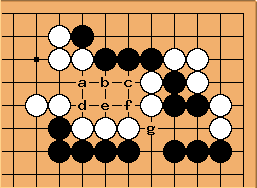 After 7 White has to live, and then Black has a tesuji at a which captures the marked stone and makes an eye. 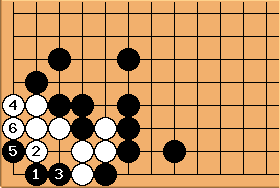 8: white 8: captures the 3 black stones including 1 and 7. 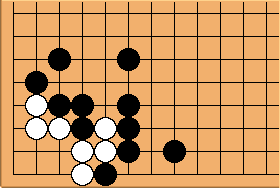 Flon: I can’t find any solution for Black. 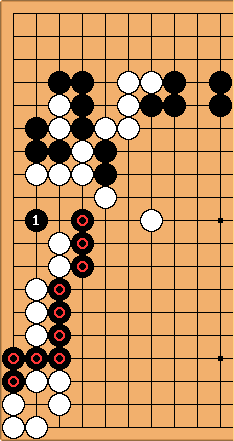 I checked the Xuanxuan Qijing, but didn’t find this problem ;-). Malcolm, 071212: Thanks Flon. 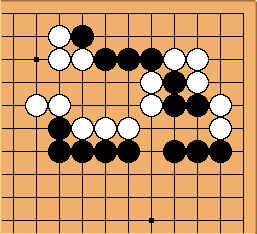 You’re right, there isn’t any solution for Black. I made a mistake copying the problem diagram from Xuanxuan Qijing Problem78. There, White has one less liberty which makes all the difference. This is also from the Xuanxuan Qijing collection (number 5). And it’s in the Gokyo Shumyo: see Gokyo Shumyo, Section 1, Problem 75 / Solution. 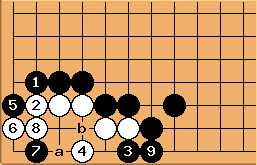 After 7, a-d. 5 is a tesuji that features in one of the Hikaru No Go stories. I got this solution from the sgf file compiled by Jean-Pierre Vesinet (see u-go.net). 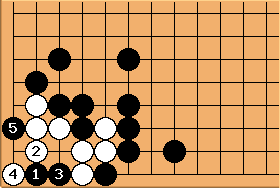 However, in the following variation Black seems to get a ko. After 9, a through to d seem to give a ko. Am I missing something? 2007-12-14: I’ve found more detail on this variation here. (2007-08-01). 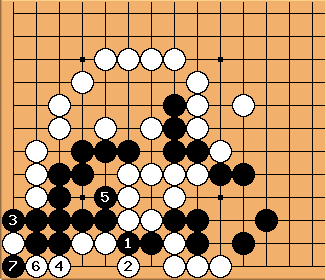 I got this problem from the mailing list of problems by Fan Hui, organised by the FFG (Fédération Française de Go). It’s supposed to be around 5D level. "|" means "or". "!" means "tesuji". It’s not easy to read, but it seems to me to be a concise way of writing a non-trivial set of variations. 2007-10-12: This notation now has its own page. (2007-09-27). I printed out the entire colection from the pdf file at tsumego.tasuki.org, and I’ve been going through the problems. I now have a new goal: work through all the problems and understand each one. Maybe I’m optimistic, but I reckon it should be do-able (within a couple of years). So far I’ve looked at about 75% of the first hundred odd problems. There are some real gems. There is a solution file, but it doesn’t give many variations. That’s not necessarily a bad thing, as it means one has to figure things out for oneself. I would recommended it heartily for dan-level players. 2007-12-28 : The problem I was talking about with tenuki as the solution: (Xuanxuan Qijing Problem 3). 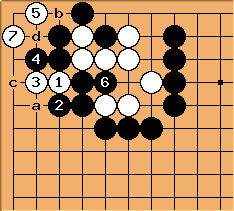 (2007-12-14:) Here are a few pages I started on SL, in no particular order: Lim Yoo Jong, Superpower Go, L'âme du Go or Four basic shapes, Audouard Coordinates, Pierre Audouard, Center Oriented Players, Concise Problem Notation, History Of Go In France 1965-2007. (2007-12-28:)I would like to compile some examples of the elephant's jump on SL, from real play. 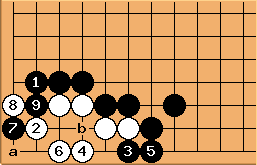 I have in mind a recent game of Lee Sedol’s. 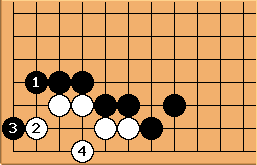 Also there’s a position from the opening of one of my games I’d like to look at too. I hope to get that done in january. My Go blog, partly in English and partly in French. Also you can find me on facebook.